Through applied learning in research, internships, and creative endeavors, students enhance their classroom learning and get a big boost toward advanced degrees, future employment, and leadership roles in their professions and their communities. Every student at the University of Hawai‘i at Hilo is offered the opportunity to apply their textbook knowledge to the real world through research, internships, creative endeavors, student employment and more. Through this type of scholarly work, students enhance their classroom learning and get a big boost toward advanced degrees, future employment, and leadership roles in their professions and their communities. I would like to share with you three of our student research programs and a few extraordinary students doing important research and inquiry of great benefit to the people of our state and the island environment. These accomplished students—and many others in these and other programs, too many to name here in this column—are already contributing in positive ways to the problems facing our island state. 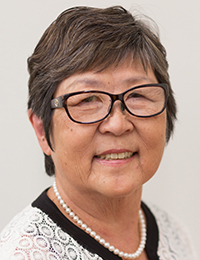 SHARP is a relatively new program, largely supporting under-represented students, particularly Native Hawaiians and Pacific Islanders, who would like to do research in preparation for doctoral studies. The students are mentored by expert faculty researchers to develop interest and competence in biomedical and behavioral sciences research. The program is funded by the National Institutes of Health (NIH) Research Initiative for Scientific Enhancement (RISE) and is administered through the UH Hilo Department of Anthropology. 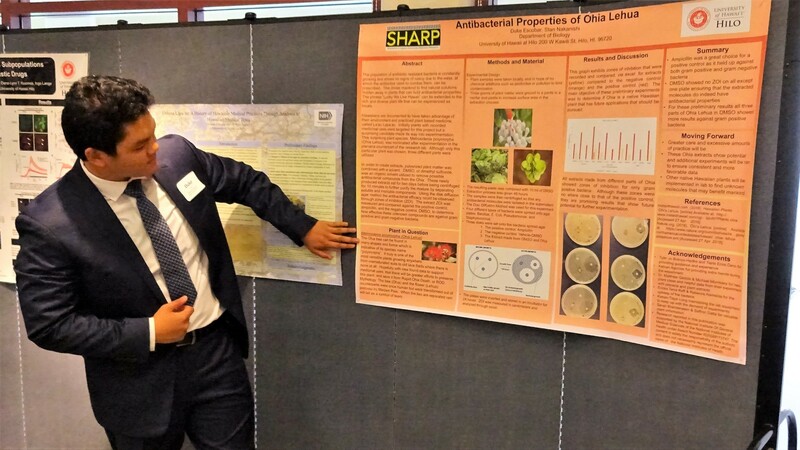 Six SHARP students showcased their research at the 2nd Annual SHARP Symposium held on campus in August. Five of the students are undergraduates and one is in a doctoral program at the Daniel K. Inouye College of Pharmacy. The students worked with faculty researchers to develop their topics and learn skills to conduct their research. Undergraduates Duke Escobar (biology major) and Kieran-Tiaye Long (psychology) are investigating the anti-bacterial efficacy of native Hawaiian plant-based medicines. Dallas Freitas (chemistry) is researching key mechanisms of ion channel signaling in cancer drug resistance and the tumor microenvironment. Duke Escobar presents his research at the 2nd Annual SHARP Symposium, Aug.31, 2018, UH Hilo. Courtesy photo from SHARP, click to enlarge. Jasmine Hicking (biology) is researching medicinal plants, specifically anti-cancer and anti-bacterial agents from microorganisms and herbal medicine. Skyla Lee (chemistry-bioscience) is doing research on synthesis and evaluation of antibacterial and anti-cancer agents in natural products. Doctoral student Nathan Sunada (pharmaceutical sciences) is investigating neuroblastoma and the mechanisms that promote cancer progression through a native Hawaiian perspective. The goal of Keaholoa is to increase enrollment, support, and graduation rates of Native Hawaiians and other underrepresented minorities in science, technology, engineering and mathematics, the STEM disciplines. Over the years, Keaholoa has become a program where minority students can engage in scientifically rigorous research that is grounded in indigenous or native cultural practices and knowledge. For example, anthropology student Rosa Motta has compiled water property data from nearshore marine environments using historical land use patterns and archaeological sites to determine the health of coastlines in terms of the ʻāina-kai (land-ocean) relationship. Physics major Gabriel Gutierrez mapped coral reef health using traditional Hawaiian canoes. Environmental science major Jowell Guerreiro is interested in restoring loko i‘a (fishponds) and collected data on flow rates during specific moon phases. MOP is a UH systemwide certificate program, offered on all UH campuses, providing educational opportunities for students from all disciplines who are interested in studying the ocean. Earlier this year, three students from UH Hilo MOP came home with awards from the statewide MOP Student Symposium held at Windward Community College. The annual event features oral and poster presentations by undergraduate MOP students from UH campuses around the state. 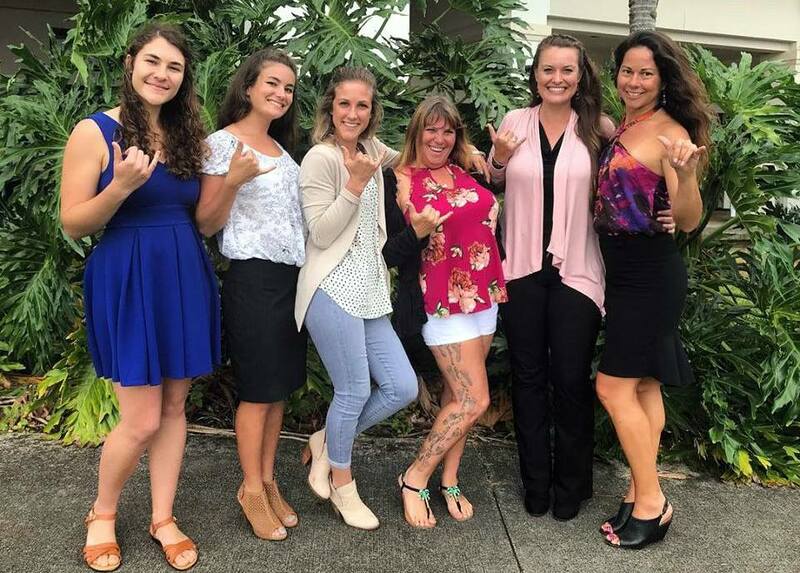 Our students were outstanding representatives of UH Hilo, and brought home major awards, including best research presentation, which has been won by UH Hilo MOP students in 24 of the past 29 years. UH Hilo delegation to the Marine Option Program Student Symposium held April 21 at Windward Community College. (l-r) Gina Selig, Andrea Ehlers, Wheatley Crawley, Michelle Nason, Julia Stewart, and Nikola Rodriguez. Courtesy photo. Julia Stewart won best research presentation for her research project on coral, an ambitious project using bioinformatics. Wheatley Crawley won best poster presentation for her project on conservation at Wai‘opae, one of the last research projects at the teeming tidepools before the recent lava flow tragically covered the area. Michelle Nason won the John P. Craven Child of the Sea award for her work establishing a coral nursery on Hawai‘i Island. Many UH Hilo graduates have benefited greatly from our various applied learning programs. When they move on to graduate school, doctoral programs, or professional positions, they are already well-skilled in doing sustainability, conservation, health, community-based research projects and more that make an impact. As we prepare for the close of the semester and Fall Commencement, I’d like to congratulate the graduating class, wish each student great success, and thank everyone for your contributions to UH Hilo, our students, and our community. Sending aloha to you and your families this holiday season!